Bank dumping: Do the megabanks even care? NEW YORK (CNNMoney) -- Credit unions and small banks say they've seen big jumps in new account openings thanks to this weekend's "Move Your Money" and "Bank Transfer Day" initiatives, but do the big banks even care? Digital Federal Credit Union, the largest credit union in New England with 330,000 total members, welcomed 133 new members on Saturday. That's 56% higher than the average 85 account openings it sees on a typical Saturday. According to the credit union's spokesman John LaHair, a majority of the new account holders said they were defecting from Bank of America, which helped spark this weekend's social-media-fueled movements when it tried to introduce a debit card fee in late September. Backed by groups of consumers like MoveOn.org and the Progressive Change Campaign Committee (PCCC), "Move Your Money" and "Bank Transfer Day" were designed to urge customers of the nation's biggest banks to switch to a credit union or community bank, which are known for having fewer and/or lower fees and penalties. "They were joining because even with the announcement that [Bank of America] was not going to charge a monthly debit card fee, they felt that there'd be some other fee down the road," LaHair said. Since Sept. 29, when Bank of America (BAC, Fortune 500) announced its plans to introduce the controversial debit card fee, at least 650,000 consumers have joined credit unions, according to a report released from the Credit Union National Association late last week. That's more than a year's worth of new members signing up in a single month -- credit unions added 600,000 members in all of 2010. While the industry trade group has yet to tally the number of new customers from Saturday yet, traffic to its web site that helps consumers find a credit union hit a record high on Saturday -- even temporarily freezing the search tool. One of its members, the 45-branch BECU in Seattle, signed on 660 new customers on Saturday -- a new record. Meanwhile, Redwood Credit Union near San Francisco told CUNA it added 75 new members on Saturday -- an 83% increase compared to a year ago -- and it said its parking lot was "jammed" with cars. The Independent Community Bankers of America saw a similar spike in traffic to its online community bank locator. From Friday to Sunday, page views jumped 500% from the previous weekend. Over the last 30 days, page views have been up 832% -- with well over 5,000 page views -- compared to the previous 30 days. National Capital Bank of Washington, a family-run, 4,700-customer community bank, opened six accounts on Saturday. While that doesn't seem like a lot, the bank only has two branches -- one of which is closed on Saturdays -- and it's typically lucky to open one account on any given Saturday. "We were booked solid all day opening accounts," said David Glaser, vice president of the bank. And this has been the trend for all of October as well, with 100 new accounts opened during the month, almost double the number of accounts opened in September. Every new customer in the past month has moved their money from a big national bank, he said. The PCCC said it received pledges from about 53,000 people to take their money out of major financial institutions by Saturday as part of the "Move Your Money" initiative, with just under 22,000 consumers planning to remove their money from Bank of America specifically. About 7,000 customers told the PCCC they have already moved their money. In addition, the tool it launched last Thursday to help consumers find a new bank or credit union, called "Banxodus," has already conducted 140,000 searches. But while the "Move Your Money" initiative provided a wave of new customers to these smaller institutions, the big banks that these customers are leaving are so big that many of them have barely felt a dent in account holdings. Bank of America, for example, has 58 million retail and small business accounts. "We feel that this weekend was a good reminder that Americans have choices when it comes to their banking relationship," said Citi spokeswoman Catherine Pulley. "We are proud to serve the millions of consumers that choose Citi bank and we will continue to work hard to earn their business." 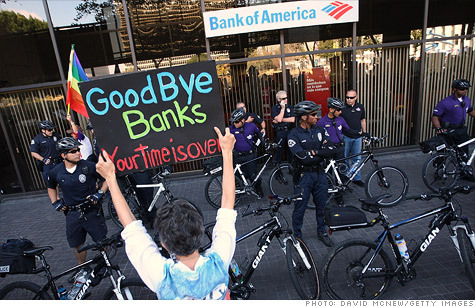 What fees will the banks try next? Wells Fargo (WFC, Fortune 500) said at the same time some people may close their accounts, other people are always opening new ones. "We start relationships with new customers every day, we also have some customers who close their accounts," a spokeswoman said. "Customers close their accounts for a variety of reasons, including moving out of an area serviced by Wells Fargo, combining accounts as with a new marriage and sometimes because they choose not to bank with us any longer." Meanwhile, U.S. Bank (USB, Fortune 500) said it did not experience an increase in account closures over the weekend -- or in the last month. But even if the banks don't remember this day forever, the customers switching banks are pretty sure they will. "Closed my Bank of America account on Sat. and I'm very happy," said a member of the "Bank Transfer Day" event on Facebook (which has nearly 86,000 "likes"). "My closure may not account for much to BofA, but I'm still glad I made the move. Thanks for this great way to celebrate Nov. 5th!"